There are a lot of misconceptions out there when it comes to exercising past a certain age. In fact, one out of four people between the ages of 65 and 74 exercises regularly. Many people believe that they are too old, too out of shape or too sick to work out at all, and that is just not true. In fact, studies show that NOT exercising can be detrimental for the physical and mental health of older folks. It is therefore up to those who care for them and about them to encourage their loved ones to incorporate some level of exercise into their daily lives. Inactivity can be a sort of self-fulfilling prophecy. The more a person moves, the easier it is to do so. Likewise, so many physical maladies are exacerbated by being sedentary, thereby making the idea of beginning a work out an even more daunting. By beginning the smallest of routines, however, a senior is effectively adding grease to the squeaky wheels, with the end-result being an overall more efficient mechanism. The greatest impediment with getting Grandpa to start moving is almost always mental. So many people assume that improving physical health through choices other than medication is pointless-that declining health with old age is inevitable. Those cases, often making the news, of folks in their 70’s, 80’s, and 90’s running marathons, becoming body builders, and even swimming great distances prove that getting decrepit with old age is not a given. In fact, many of the physical symptoms associated with old age can often be attributed to inactivity. An argument can be made that a twenty-year old leading a sedentary lifestyle might also experience a level of weakness and loss of balance. The difference there being that the younger person hasn’t been conditioned to believe that such poor health is just a part of life. One of the things some of those senior athletes always say is that they don’t “feel old”. It may be a chicken and egg kind of situation that causes this, where they don’t feel old, so they exercise, or they exercise so they don’t feel old, but it’s clear that exercise can do more than improve a person’s physical health. One study out or Goethe-Universität Frankfurt am Main concludes “regular physical exercise not only enhances fitness but also has a positive impact on brain metabolism”. Many of the reasons, or excuses, folks give against exercising are the same regardless of age. If a person has never worked out before, they may believe it’s too late to start. Studies have found even people that start mild work outs even late in life (we are talking 90 years old in nursing homes) can boost muscle strength, cut the risk of health problems and improve symptoms. People of all age groups believe they can’t fit it into their schedule or that it’s boring, but according to the Centers for Disease Control and Prevention, just 150 minutes of aerobic exercise a week can be enough to see quantifiable improvement in overall health. This means taking a brisk walk with their caretaker, a pet, or a grandchild for a little over 20 minutes a day can be an effective and interesting way to absorb movement into a routine, and mental stimulation along with it. There really are so many options these days to get a person moving and more fit. 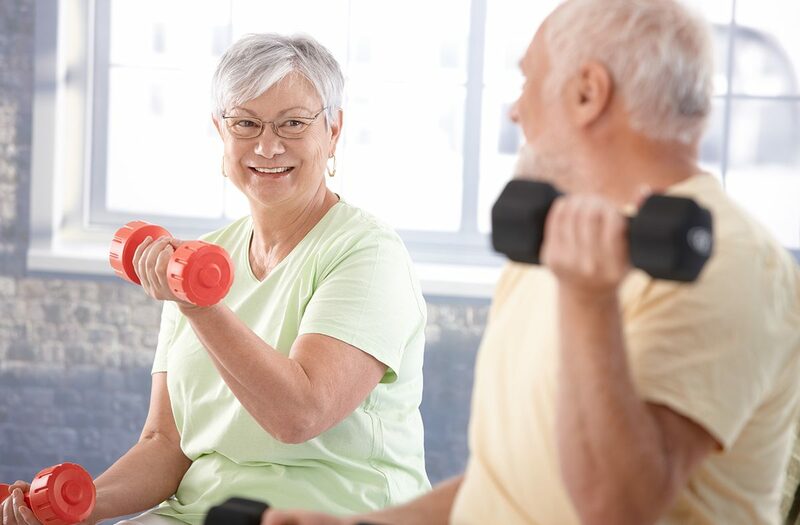 Many seniors find the concept of going to the gym scary, as do many non-athletic adults, but with the assistance of the internet, it is possible to find your love one any number of groups or activities to be a part of to get them interested in improving physical health. Many public libraries offer programs such as senior yoga and Tai Chi movement, which not only provides the physical activity you want for Mom or Dad, but also social connections and an aspect of mental health conditioning that can only be beneficial. In the end it doesn’t really matter what type of exercise you can get your senior interested in. The key is to find something that he or she really enjoys doing, that they can look forward to doing, and that they DO. Doing so can only improve their mental and physical health, independence, and overall quality of life.